It’s kind of hard to believe but we welcome back summer next week, which means this year is nearly halfway done. We had an especially rainy fall here in Montana, followed by record snowfall and cold temps over the winter, and record rain in the spring. I think I read somewhere that we went over six straight months without a 60 degree day. I mean, not even as a fluke warm spell! 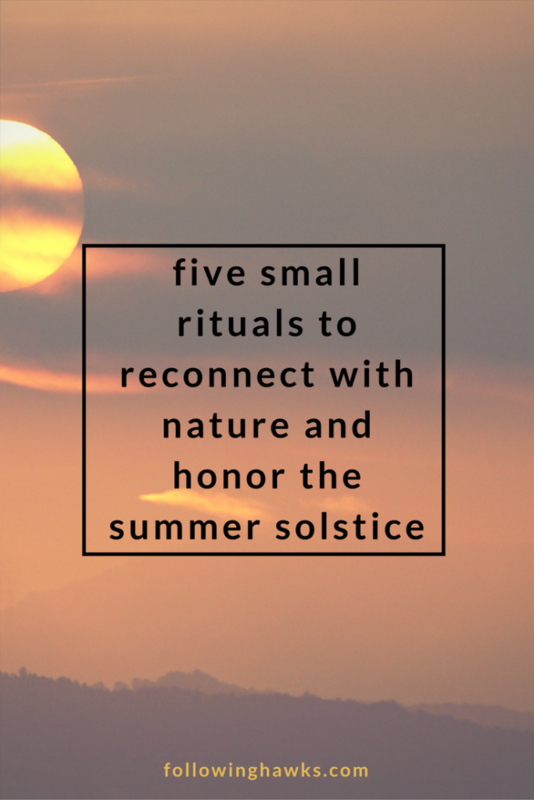 So to celebrate, my guides have suggested five small rituals to reconnect with nature and celebrate the summer solstice. As much as I try to enjoy each season to it’s fullest and not pine away for future months…I was ready to jump off a bridge if I didn’t see the sunshine about a month ago. But, as the spring days ticked by, the sun did return and it finally feels like summer might be possible this year. To welcome this long awaited (and hard earned) season, I asked my guides what I could do to reconnect with my surroundings and honor the solstice. 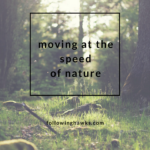 They gave me five small rituals to reconnect with nature. I’m going to share my experiences over these five days on Instagram and would love it if you join me for one or all of them. Use the hashtag #hellosolstice to post your photos and follow along starting tomorrow, Saturday, June 17 and continuing through Wednesday, June 21. Solstice officially arrives on June 21 at 4:24 UTC, which translates to 10:24pm the night prior here in Mountain daylight time. Since it straddles two days depending on your time zone, I decided to officially celebrate on the 21st. The only thing you need is a notebook you don’t mind ripping pages from to burn in your solstice fire because OF COURSE there will be fire – it’s a solstice celebration! Day 1, Saturday: Go outside barefoot, walk around, talk to the grass, and feel the sensation of the earth under your feet. Set a timer for 15 minutes and write down the sights and sounds that you notice. Really take the time to observe your surroundings in detail. Day 2, Sunday: Find a tree that you particularly like or catches your attention. Wrap your arms around it (it’s okay, let the neighbors see you do it) and then sit down with it however feels comfortable. Do you feel like the tree has male or female energy? Why did you pick that tree? Close your eyes and see what comes into your awareness. Notice colors, shapes, thoughts and ideas and write down your experiences. Day 3, Monday: Go for a walk or hike in nature. Notice the flowers, feel the breeze on your face. If you can, pick a route that will allow you to go up a bit higher to get a little perspective. Pick a spot that you can sit quietly and ask if there are any messages for you. Make notes in your journal. Day 5, SUMMER SOLSTICE: Build a fire – this can be as small as a candle in your living room or a large bonfire in your yard. Set your intention for this to be a ceremonial fire for the time that you are in ritual. Call in your helping spirits and give an offering to the fire (sage, flowers, tobacco, whatever you feel intuitively guided to do). Quietly review your notes and messages from the past four days and add any additional thoughts. Then, burn them in the fire to release the past season and move into the energy of summer. Thank the helping spirits and release them from the ceremony to close the ritual. You may then continue to enjoy the fire and celebrate the return of the summer season with food, drink, friends and family if you so choose! So, that’s it – easy, right?! It can be as few as 15 minutes each day or as long as you’d like to enjoy being out in nature. I can’t wait to see your photos and hear about your experiences. Don’t forget to tag #hellosolstice in your posts and Happy Summer my friends!! What would I celebrate seeing as we are in winter in South Africa? Winter is all about going within, resting after the energy of the summer months and releasing of the fall. So ask your helping spirits what actions or rituals you can take to prepare yourself for the dark winter months. But a fire on the actual solstice is still an appropriate way to welcome the changing of the seasons. Would love to see your ceremonies in South Africa! I want to Thankyou for making me aware of nature and building a new relationship with the land , I have cleaned up the garden ,planted flowers , left offerings and asked permission❤ Last week I got poison ivy , my fault for not recognizing it! Instead of feeling insulted I thought about its role in protecting the forest and thought maybe it’s teaching me boundaries. How do I deal with it without using chemicals and will killing it be disrespectful ??? Oh that’s so wonderful to hear, thank you for sharing! I agree with the poison ivy and boundaries – I haven’t worked with it before (we don’t have it in our area) but I would bet that it has some kind of biological purpose in the landscape. I would say that if it’s in an area that you can avoid, just leave it be and let it do it’s job. However, if it’s in a spot that you can’t help but come into contact with on a regular basis, you can ask if it’s okay to remove it for the safety of your family. I find that generally the plants and trees understand things like that “for the greater good”. If possible, I would put on long sleeves and pants and gloves (and a face mask if you’re especially sensitive) and hand pull it and put it in a garbage can. Worst case scenario, if it’s covering a large area, you could look into natural or organic products that would kill it without poisoning the soil.